For sale beautiful two bedrooms semi-detached Bungalow Parque Holandes with terraces and lots of outside communal space for sale, opposite to the pool area. 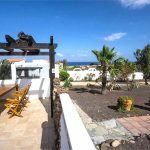 Situated in the quiet town Parque Holandes, 10 minutes from Corralejo and Puerto de Rosario, near beaches. It has a covered terrace with dining area and a well sized living room with open kitchen area, two bedrooms and a bathroom with whirlpool and shower. Lots of storageroom where washingmachine and freezers are positioned, and on the terrace you will find a an outdoor shower area, as well as a patio behind the house. Surrounded by a lush garden and steps away from the pool. Parque Holandes is an urbanization located in the east cost of Fuerteventura between Corralejo and Puerto del Rosario in La Oliva municipallity. It was designed by a Dutch architect and you can find there as villa as apartment with good prices. In Parque Holandes there are restaurants, shops and a shopping centre that is just in the heart of the urbanization. The amazing beach called Playa Alzada is only 5 minuts driving by there. 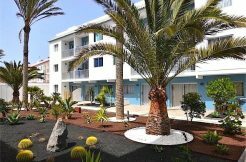 Parque Holandes thanks to his position is a good place to buy home in Fuerteventura.